Two years ago today, José and I were married in Los Cabos, Mexico, in front of nearly 100 family members and friends. I can still remember most of the day very clearly, though it went by very fast. Sometimes, it seems like it was just yesterday. 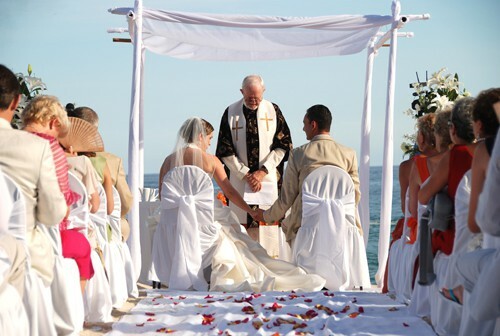 We were first married in a small Catholic ceremony in a beautiful historic church in San José del Cabo with just our parents and witnesses, and then later in the evening we had a full Catholic mass on the beach with all our guests at the Westin Los Cabos. 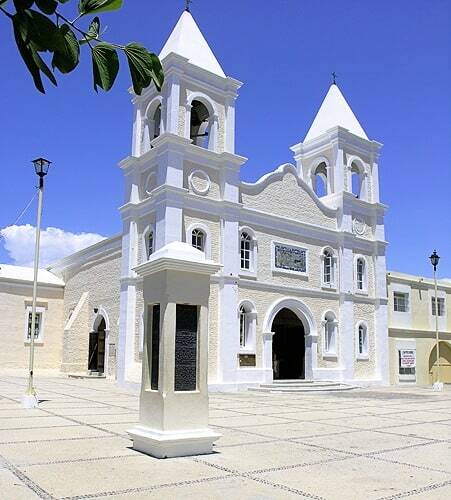 The church where we were married, Misión de San José del Cabo Anuití, was a mission originally built by a Jesuit priest, Father Nicolás Tamaral, in 1730. It has been destroyed and rebuilt several times, and the current twin-tower structure was last restored in 1932 after it was damaged by a hurricane. The church satisfied my love for history, architecture and art, all in one. The whole day was completely perfect from beginning to end. Okay, it wasn’t completely perfect (it was blazing hot even after the sun set), but it was damn near perfect. If I could do it all over again, the only thing I’d do differently is savor each moment individually, like in slow motion. I’d hug each person a little tighter, and add a few more family members who couldn’t be there with us. Unfortunately, I can’t do it all over again. But I’m okay with that because I know that our wedding day was just about as perfect as they come. Sadly, I also don’t have photos of the food we served at our wedding. I’m sure if I look through all of our family and friends’ photos, I might find some halfway decent shots of what they ate. None of which would be beautiful or tasty enough to do the menu justice, I’d bet. I do, however, still have a copy of the menu so you can imagine it. Yes, we served our guests flan for dessert instead of having a traditional wedding cake. We chose to have a very small pastel de tres leches to cut at our reception. 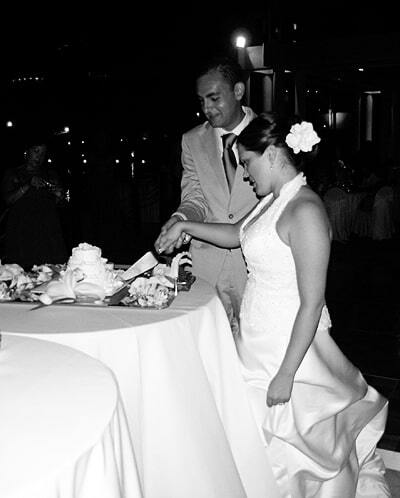 We ate one slice and then the cake was whisked away and saved for us to eat throughout the rest of our honeymoon week. We ate. We drank. We laughed. We danced. We danced all night long. Our wedding even had an after party – until around 4 a.m. (hours after we’d retired to our honeymoon suite), and then those who were truly hard partiers, as we learned the next day, took their celebrating to the beach. To this day, our friends still talk about how much fun they had at our wedding. We received so many gifts, some from people I didn’t even know and that José had perhaps only met once. Thankfully, most of the gifts were sent to our home in Chicago instead of brought to Los Cabos for the wedding so we didn’t have much extra to carry home. One of my favorite gifts we received, though, was from a friend who did not make it to Los Cabos to celebrate with us. It was a simple but beautiful pair of antique silver candlesticks. They had been sent to my suegros’ house and we brought them back home after our next visit to Mexico City after the wedding. The accompanying card was what touched me most. Encontré en La Lagunilla este par de candelabros para que siempre haya luz en su matrimonio. Haga votos para que el amor, la fuerza y la humilidad los iluminen. ¡Muchas felicidades! This week, I vow to polish my candlesticks and use them. I normally display them on a shelf and they’ve gotten quite tarnished over the last few months, as you can see. I challenge you to take out your favorite pair of candlesticks, clean them if necessary, and use them in the next week or two to dine by candlelight with someone you love. Until I met José, I never knew it was possible to love someone more and more each day. He was a big part of my inspiration to start this blog and he has always encouraged my writing here. Even when it’s about him. And for that, I love him even more. Feliz aniversario, mi amor. Te quiero muchísimo. Ay! Qué romántico! I don’t plan on gettin married quite yet, but espero encontrar aquel hombre que haga sentir lo que tú sientes. Loved reading your story, very romantic. Feliz Aniversario! I am sure it was a beautiful wedding. I love Los Cabos so I am sure it was great! I just got married in Merida, Yucatan in Mexico at an old hacienda. 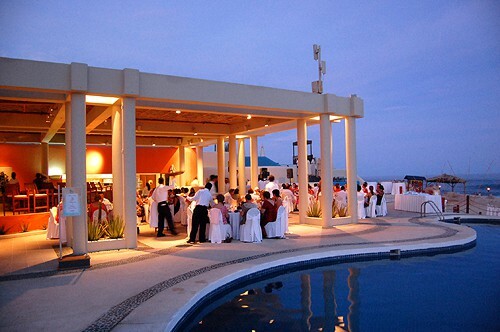 Mexico has some of the best venues for a wedding, right? That church is gorgeous, and I love the antique candlesticks. And an extra congrats on being Freshly Pressed. Thank you for sharing, and Happy Anniversary! God bless you both. Happy anniversary — married love is my favorite! Your wedding looks and truly sounds like a magical day! All the photos look so beautiful, and I have to say the menu… a dream. Thanks for sharing your special day with us. beautiful wedding In Mexico Wow! best place to do so… Félicitations! Aww. Beautiful story. (And mouth-watering menu, too.) Felicidades to the two of you! That was beautiful! 🙂 Thank you for such a great post! Congrats on your anniversary! And I need to see more wedding pictures, they look fabuloso!! Your words and photographs took me miles and miles away, to Los Cabos…You write so beautiful and honest. Felicidades y que viva el amor…! Beautiful. Felicidades to you and José…and many years more! Hi there – new to the blogosphere, but I just had to leave a comment! Everything looks beautiful, and your dress was perfect! My favorite part? Flan as the dessert! Wow, it looked amazing! I’m pretty jealous right now. No way ever will I be able to afford such a gorgeous wedding. Congrats! BTW the food sounded yum-mie! What a beautifully simple yet elegant beach wedding. Beautiful!! Love your pictures. Soooo romantic!!! Thanks to all who left such lovely comments to congratulate us on our wedding anniversary! 🙂 A lot of people have requested that I post more wedding photos so I’m working on a little slideshow to share soon. Felicidades! I love those pics. Muy linda boda.